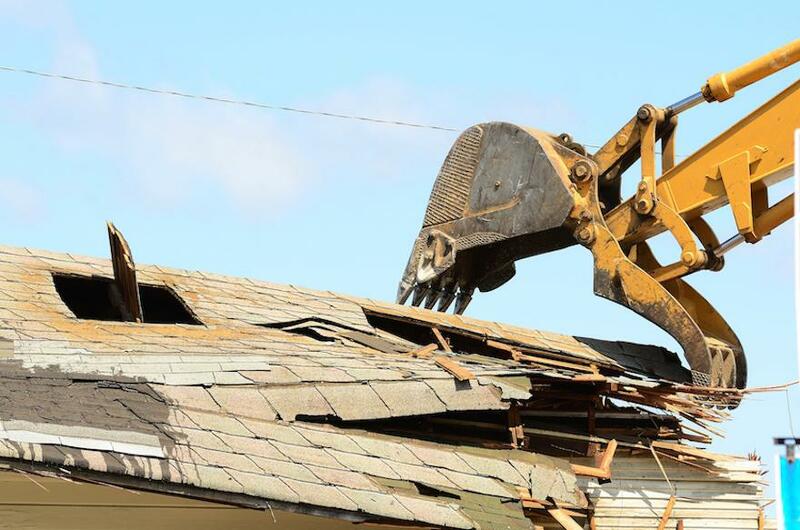 On the face of it, demolishing an old house may seem like a quick and easy job. Sure, your old property can be bowled over in the blink of an eye, but a lot needs to happen before the bulldozers can get to work. From the time the house becomes vacant, it will take two to three months to gain the necessary demolition permits, make the necessary preparations on site and then carry out the demolition work. The length of time this all takes is the biggest misconception when it comes to ‘demolish and build’ projects. It’s also important to remember that the old property you are demolishing will have been built according to the building and planning codes that applied at the time. This means you might not necessarily be able to rebuild in exactly the same spot. Planning and building codes evolve over time, and what is called the ‘building envelope’ may have changed, too. New conditions may therefore be in place that might have a bearing on the size and height of the home you want to build. With this in mind, we strongly recommend that you do not demolish the old property on your block until after you have both planning approval and a building contract in place. Only then can you go ahead and demolish with confidence, knowing you can build the home you want, at a price that has been agreed. The cost of demolition will depend on the size of the home, the materials that were used to build it, how big the block is and whether there are additional structures such as sheds, pools and fencing to be removed. As a rule of thumb, it costs from about $15,000 to bowl over a two-bedroom, one-bathroom weatherboard home, up to $50,000 or more to flatten a substantial brick and tile two-storey. Bear in mind that the entire block needs to be cleared. It may be a small house that’s being knocked over, but if it’s on a sizeable block, there could be vast amounts of vegetation to be removed and sent to the tip at extra cost. Before you can apply for a demolition permit, the block has to be fenced off, and services such as gas, power and water disconnected. The old dwelling must also have been rat-baited for two to three weeks, depending on the requirements of the local council, before you can submit your application. The demolition permit will then usually take between five and 30 days to come through, depending on the council you are dealing with. Your subcontractor can then schedule your job. The actual demolition will typically take two weeks, depending on how much is to be salvaged from the old house. Some demolition companies do little in the way of recycling and will send the bulk of the old house to landfill. Others will take several weeks to strip out recyclable materials as the relevant sub-contractors become available to remove items such as bricks, roof tiles and paving. Even mature trees such as frangipanis and grass trees can be recycled. Generally speaking, the more that is recycled or salvaged, the longer the demolition process will take. Some companies provide low quotes based on a high percentage of salvage and a longer demolition timeframe, but this could prove a false economy if you’re paying rent or making mortgage payments in the meantime. If you plan to salvage items from the old property yourself, do let your demolition contractor know this before you sign a contract with them as they may not have factored this into their quote. They may have provided a lower quote because they planned to sell some of the materials they were removing from the site. Sadly, hanging on to salvaged materials so that you can use them in your new home is only worth doing if you are prepared to pay a big premium. It may make ecological sense to recycle in this way, but unfortunately it doesn’t make financial sense. That’s because the labour costs are higher when working with recycled timber and bricks, for example, than if you’re buying new. Asbestos: Common in older properties and usually easy to identify, asbestos must be dealt with by a licenced asbestos removal specialist. Any asbestos removal should be stipulated in the demolition quotes you obtain. Risks: Demolishing a house can be a pretty brutal process and there’s a chance your neighbours may well feel the impact. With this in mind, demolition companies will usually recommend that they carry out dilapidation reports on surrounding properties before commencing demolition. These reports record the condition of neighbouring properties before demolition begins. Once the old house has been demolished, Residential Attitudes will carry out its own dilapidation reports on the adjoining neighbouring properties to establish their condition before we start building your new home. Contractors: Using a recommended contractor is always advised. Companies that take short cuts, such as burying waste on site only for it to be dug up again during your build, will end up costing you time and money in the long run. Fences: You will need to establish whether dividing fences are staying put, at least for the time being, or whether they will be removed as part of the demolition contract. When talking to your neighbours about your plans, remember that they will soon be living next door to a building site so it often pays to be generous. Obstacles: Tree roots can often extend out across property boundaries and the removal of trees on your block may therefore disturb your neighbour’s garden beds or paving. Again, it pays to be patient, courteous and considerate towards your neighbours. Your Residential Attitudes supervisor can provide guidance and will work with everyone to make sure all activity on your site causes minimum disruption. Residential Attitudes has a list of recommended demolition contractors and will happily arrange quotes for you, but we suggest you engage the selected contractor direct as arranging for an old house to be demolished is a simple process. We’re always happy to review any quotes that you obtain so that you can be sure all the detail has been covered.